James Table is a creation of Gridy design studio. Small rounded table does not only have a nice coffee or side table properties but also storage space and a tray-tabletop for serving drinks and food. James Table is multipurpose. It comes with a storage space under its removable tray-like tabletop. James Table designed by Gridy has a sweet rounded shape resembling a UFO. It can be used as a coffee or side table. 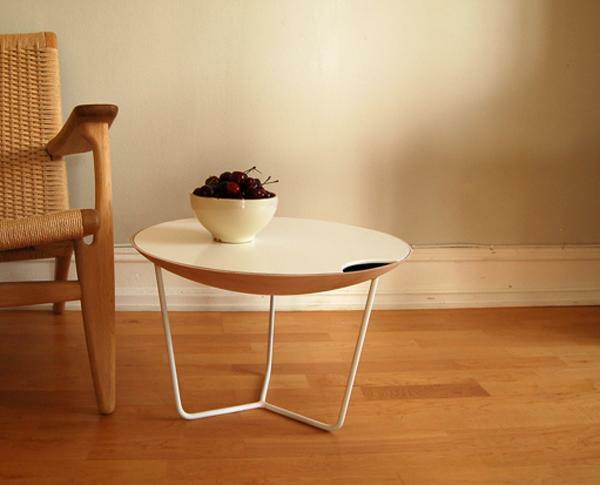 James side table is a multi functional furniture. It has a small storage space, and a tabletop which also serves as a tray. It is always at your service, hiding small objects, serving drinks or functions as a small table. I like how everything about James Table presents a different function. Tray tabletop is great and very convenient. No more multiple trips between the the kitchen and living room. And additional storage space can never hurt.